Yawn to New Years Resolutions! 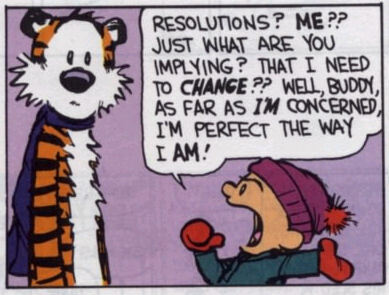 New Years Resolutions. Oh the pressure! This morning, after dropping numerous things and tripping over several others, I did one of the things that always makes me feel better. Take a long, hot, steamy shower with all my favorite lotions and potions. As I take my pouf and start sudsing myself down, I look down at my outer thigh. There is a bruise the size of a large grapefruit there! I stop and think, where did that come from. I mean, this is the kind of bruise that has a story. LOL. Then I realized. Oh yes. PMS. Do these things ever happen to you? So I was relieved that all this klutziness and bruising was cyclic. And moved on to other projects for the day. As the day wore on, I got quite a bit done but noticed that I was really spacy. I have a pretty bad cold, so I attributed it to that. On I went with my work. It got worse. I was doing things I NEVER have done. I was surprising even me. Finally, after a day of klutziness, spaciness, doing things I’ve never done before, complete exhaustion, bruises with no fun story attached, I stopped. Then I started again, because after all, this is the first REAL work day of 2011! I have sooooo much I want to do, have to do, need to do. It’s New Years and we must get to those resolutions. Then I did another thing I never ever do. And it really surprised me. I was taken aback surprised. So I stopped. And I finally realized what had been going on. Expectation had reared her ugly, bratty little head. So here is my New Years Proposition to you. Let’s work together to stop the expectations. “Society’s Rules” are only rules if you let them be. Let the masses follow the rules. You and I both know that by breaking them, sometimes magic happens. I’m not talking about hurting others. We shouldn’t be doing that. I’m saying if your tired, acknowledge it and stop. Figure out how you can take care of you so you aren’t just getting by. Then when you get a “no” to something you want, you see it as a little challenge. “Hmmm…you say. That didn’t work. I wonder if this will?” It’s not giving up when you take care of you first. It’s like the lioness in search of prey. She sits back, slows down, looks for the best odds of winning and goes for it. When you’re PMSing, sick, hurting and “the crazy” is flying at you, sit back, relax and just stop. It’s okay. The world and your body is telling you to slow down. And after you take that rest, it’s amazing what you can see, the ideas that you create and how much more you can get done. Dare to stop. Dare to listen what your body is telling you. Trust YOU when you’re surrounded by the worlds’ noise. Dare you are so freaking right!!! Love love how you came to stop and let yourself heal when you were sick! I love your stillness and your take on challenge to stop!